It’s a brand new week and a brand new episode of the Big 5 Daily! Excited, aren’t we? 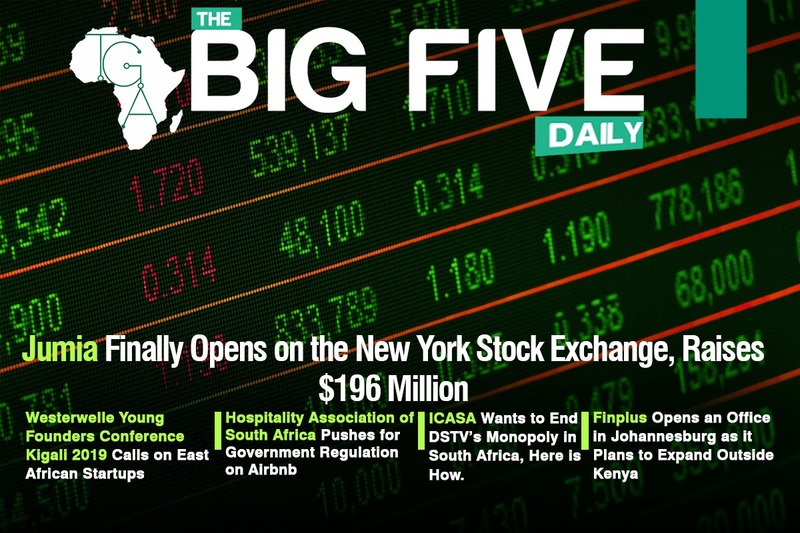 Well here’s a compilation of today’s edition of the Big 5 Daily! Over the weekend, e-commerce platform, Jumia finally listed its IPO on the NYSE amidst controversies regarding how African Jumia is. They raised the sum of $196 million having sold 13.5 million American Depositary Shares at $14.50 each. Though this is a good development for Jumia but due to the competition, we are worried for what this holds for other African e-commerce platforms. There is news that the Federated Hospitality Association of South Africa (FEDHASA) and other small organizations has called on the government to regulate Airbnb, an e-rental platform that lets people find accommodation in more than 191 countries across the globe. The reason behind the call is that unregistered accommodation establishments listed on Airbnb are taking away potential customers from already established hotels. The Independent Communications Authority of South Africa ICASA has made a move to end DSTV’s Monopoly in South Africa. They tend to end this by; shortening long-term contracts and prohibiting automatic contract renewal, unbundling sports rights and making it an open tender with no automatic renewal of contracts, splitting of content rights and selling them to more than one broadcaster in South Africa. This development will be a great avenue for new organisations to step into the market, don’t you think so? Finally, Finplus, a software business enterprise that gives financial services to fintechs that is based in Kenya, with customers across Kenya, Tanzania and Uganda has expanded to Johannesburg. The expansion will increase Finplus’ software-as-service (SaaS) platform which allows efficient control of digital deposit, loans, and insurance to South Africa. …and that’s it for today’s edition, hope you had a good read!